Just when we thought that the era of incessant strike actions in the country has embraced the abyss, the Academic Staff Union of Universities (ASUU) unexpectedly pays university students an August visit. Just like every other August visitor, this unexpected visitor never failed to go along with a package. ASUU on Sunday declared a nationwide strike action to commence the same day, Sunday, August 13, 2017. The Union took the decision to declare the strike after deliberations at its National Executive Council (NEC) meeting held at the University of Abuja on August 12, 2017. The strike action is to be a total, comprehensive and indefinite action whereby no form of academic activities including teaching, attendance of any meeting, conduct and supervision of any examination at any level, supervision of project or thesis at any level should take place at any of the nation’s universities. 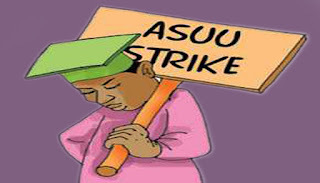 See details on ASUU Strike Bulletin HERE.